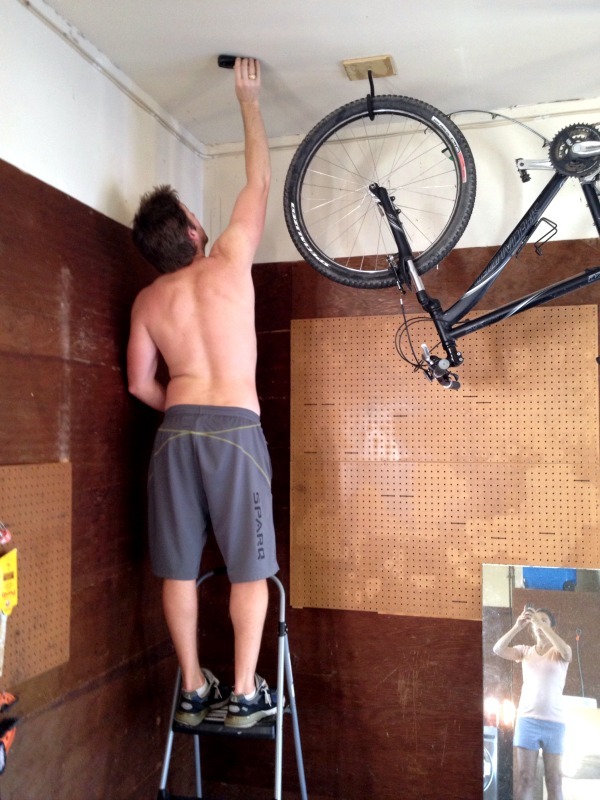 How to hang a bike from the ceiling - C.R.A.F.T. Where do you store bikes? Back in our Austin condo, we had to store them in our laundry room. That wasn’t fun. And in Florida, we had to cram them in a tiny hall closet on the 16th floor of our apartment building. Needless to say, the garage thing is so nice. And the fact that you can just hang bikes from the ceiling seems like a miracle! 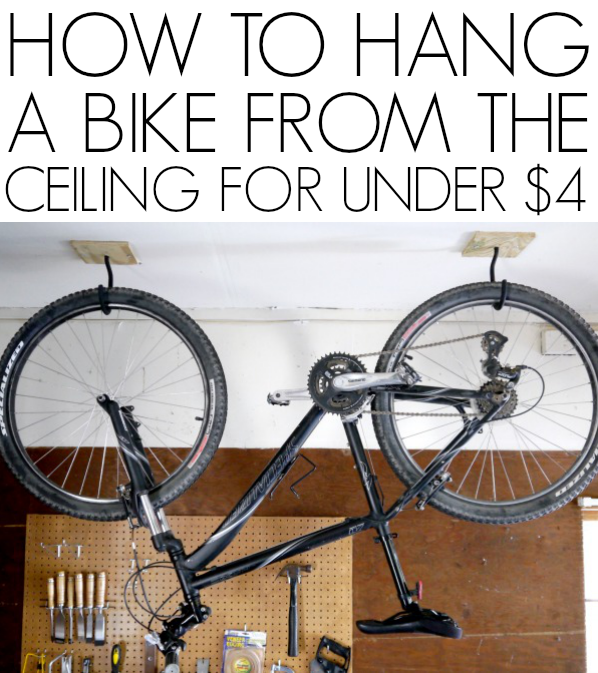 Not to mention it costs less than $4 to hang one bike! Back in December, Andy and I organized the heck out of the garage and stuck these bikes on the ceiling. 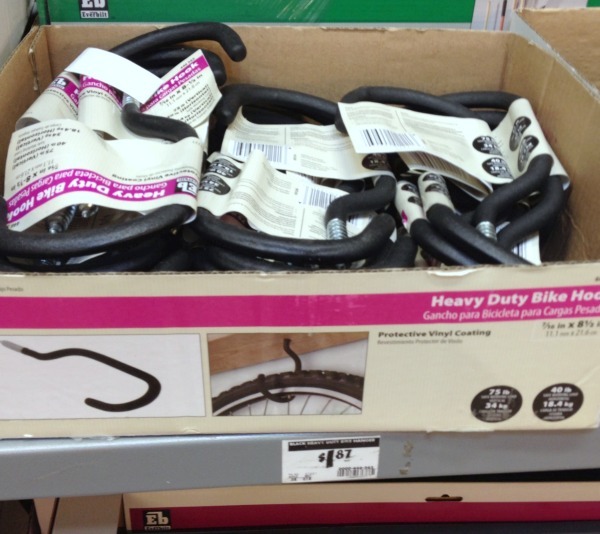 heavy duty bike hooks (2 per bike): I bought ours at Home Depot, but these are very similar on Amazon, and 8 for $13 is a slightly better deal! Here are the miracle-maker bike hooks from Home Depot for $1.87 each: After you have all of your tools and materials gathered, start searching for studs in the ceiling. 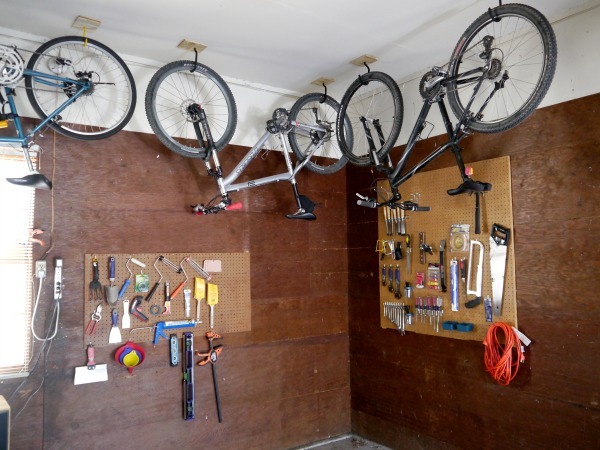 Ideally you will be able to hang your bikes in the same direction that your studs are running. This will allow you to anchor both bike hooks into a stud. 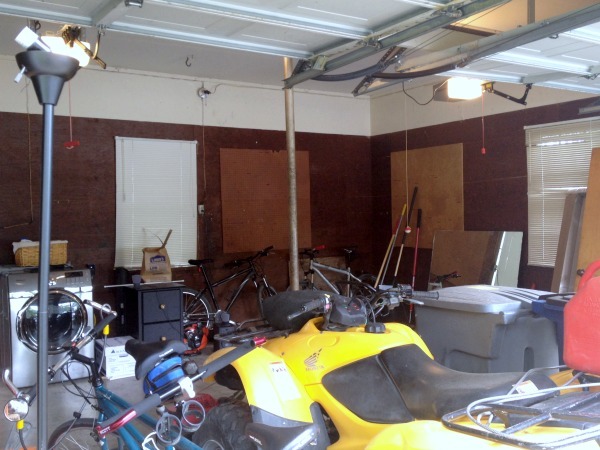 Due to the layout of our garage, we had to hang bikes in both directions (parallel to the studs and perpendicular to the studs). This meant that only one of the bikes could have both hooks secured to a stud. Andy had to secure some of the bike hooks to the sheet rock without being able to hit a stud because the spacing between the bike wheels is not the same as the spacing between the studs. Hanging things from sheetrock only makes Andy nervous, so he puts enough anchors in the plywood to hold up hundreds of pounds! Andy located the studs and made some pencil marks so he knew where to place the screws. Then he measured the space between the tires. The trick to this is to see where one tire touches the ground and to measure from that spot to where the other tire touches the ground. This is the amount of space you want between your hooks. Andy pre-drilled holes in the plywood for the bike hook and for the screws he was using to attach the wood to the ceiling/studs. Pre-drilling holes is a good idea to avoid splitting the wood. Andy wanted the plywood up there to give the bike hook a little more “meat” to screw in to. If studs are available, you can screw the hook right into a stud and forego the scrap wood pieces. This is Andy over engineering all things hanging… see this giant mirror and this mirror. 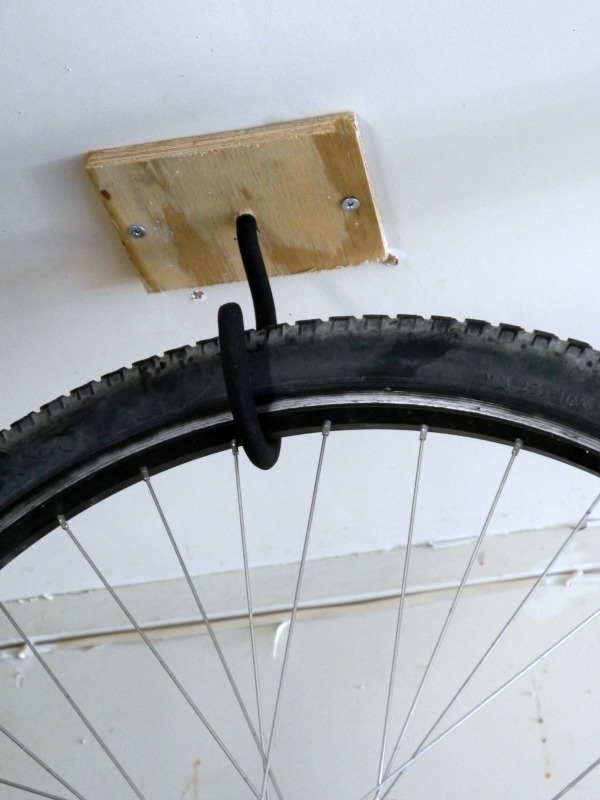 Once you have attached the plywood to the ceiling/stud in a couple places, just screw in the bike hook to your pre-drilled hole. And voilà, you have instant space in your garage! Wow! Compact! There is a great to store a bike. Thank your sharing! Any tips if ceiling is cement? Thanks for sharing. Nice job!